Baltimore’s favorite Friday night concerts are back! 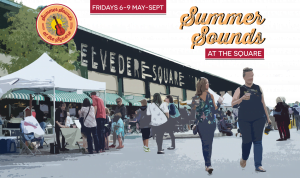 All summer long, bring the family to Belvedere Square and enjoy an evening of FREE live music, featuring some of the area’s best local acts, outstanding food from your favorite Belvedere Square Market tenants and plenty more. We’ll #SeeYouatTheSquare! No alcoholic beverages may be brought into the event- Maryland ABC rules prohibit bringing alcoholic beverages into events where alcohol is sold.